Day of the Kitten at Belmont on Friday afternoon—and race 4 had “hunch bets” written all over it for me: three Kitten’s Joy offspring (Raise the Kitty, Lisa’s Kitten, Jill’s Kitten) and an Afleet Alex filly. Unfortunately, they were all blown off the track by Will Phipps’ first time starter Mehndi, who became my favorite two-year-old. 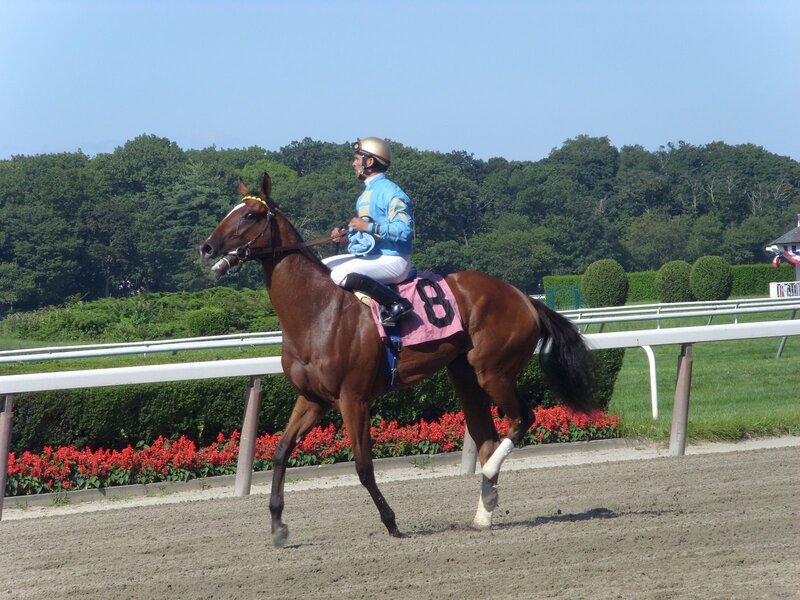 I bet the kitten horses at my peril, according to Ed DeRosa via Twitter, and the Ramseys’ naming penchant (they own Lisa’s Kitten and Jill’s Kitten, as well as Dean’s Kitten, who raced Saturday) was observed by Valerie at Foolish Pleasure. A very quick search reveals that the names of the Ramsey children are Jill, Scott, Jeff, and Kelly, and that there is a Kelly’s Kitten out there, as well as a Scott’s Kitten, but the latter is no relation to the Ramseys or Kitten’s Joy. No info yet on the names of grandchildren. According to Maiden Watch at the Blood-horse, one of two more Ramsey Kittens will be in action today at Ellis: Steve’s Kitten and Painted Kitten. Also noted in the article are Kenneth’s Kitten, Patti’s Kitten, William’s Kitten, and Nittany Kitten. I could go broke if this keeps up. Hunch bettors might have gone with the inebriation exacta in race 5—El Borracho and Five Cases—but only those with impaired ability would have used the latter, who went off at 60-1 and finished fourth. El Borracho was second; the superfecta paid $543. And is anyone paying attention to Norberto Arroyo on long shots? He was on Five Cases; last Saturday he brought home Offensive Attack at $73; and yesterday he won the last race on Skyebay, who paid $96.50. 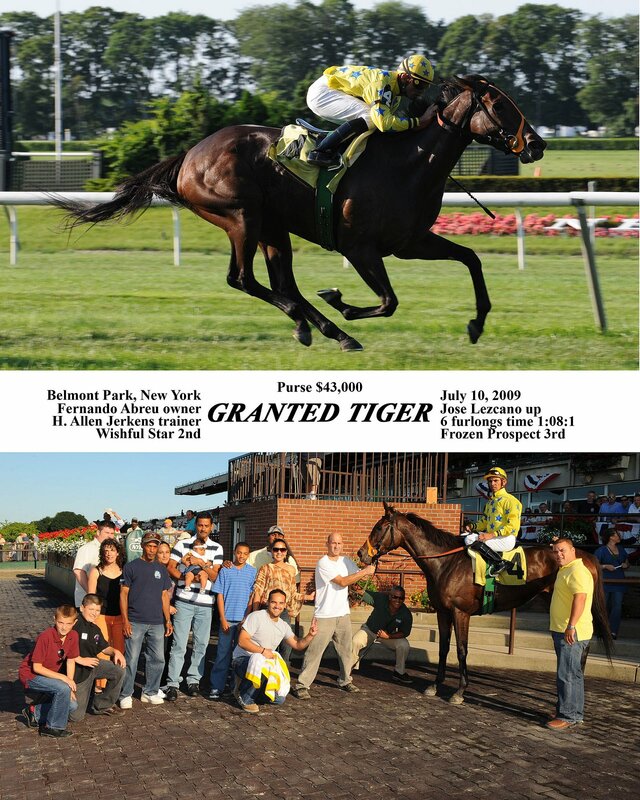 A terrific moment in the seventh race, when the Chief sent four year old filly Granted Tiger to the post; her record was 14 – 2 – 2 – 1, and she’d thrown in a few clunkers in her last few races (though, granted, one of them was the Shuvee). The filly is owned by Jerkens’s assistant Fernando Abreu, and she was looking for her first win since January. And she found it! Sent off as the favorite, she sat off the pace and made her move in the stretch, pulling away to win by two lengths. The Chief missed it (word has it that he was at a family event), but the exulting of Fernando and his friends more than made up for the Chief’s absence. Congrats, Fernando! (Disclosure: I headed to the winner’s circle to take pictures, realized that I didn’t have my camera, and was invited into the photo. Wrong side of the camera, but thrilling nonetheless to be a part of this very happy moment.) Photo credit to Adam Coglianese. programs better served by horses of mixed breeds. Lindros is proving otherwise. Sean Avery hasn’t raced since his lone start last summer at Saratoga. Thanks to Trackmaster for past performance information.